The fresh blueberries pack a lot of natural sweetness into these low sugar gluten free blueberry cornmeal muffins. Preheat the oven to 375 F. Grease a 12 cup muffin pan or line with paper liners. In a large bowl, whisk together the brown rice flour, quinoa flour, tapioca flour, xanthan gum, baking powder, salt and cornmeal. In medium bowl, whisk together the eggs, applesauce, milk, melted butter and vanilla until all ingredients are blended. Add the wet ingredients to the flour mixture and stir until evenly moistened. Gently fold in one cup of the blueberries being careful not to break them up too much. 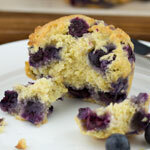 Pour the batter into the muffin cups and press the remaining 1/2 cup of blueberries into the tops of the muffins. Bake for 25 - 30 minutes or until a toothpick inserted into the centre of a muffin comes out clean. Let cool for about 5 minutes in the pan then transfer to wire rack. For a sweeter muffin, replace the cup of unsweetened applesauce in the Mildly Sweet recipe above with 1/4 cup sugar. Whisk the sugar in with the eggs, milk, melted butter and vanilla in step 3. Omit the unsweetened applesauce. Adapted from: Blueberry Lemon Corn Muffins from epicurious.com.